The Saturn moons Dione (left) and Mimas (right) are dwarfed by their giant parent planet in this photo captured by NASA's Cassini spacecraft on May 27,2015. Two Saturn moons appear to be gazing up at their giant parent planet in a stunning new photo taken by NASA's Cassini spacecraft. The new image, which was released today (Aug. 4), captures the satellites Dione and Mimas, with Saturn a blurry behemoth looming in the background. 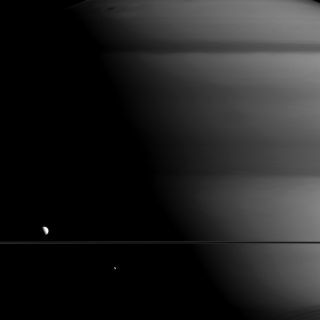 Sunlight is hitting the moons at such an angle that they seem to be staring up at the ringed planet, NASA officials said. The surface of Mimas is dominated by a huge crater named Herschel, which makes the moon look like the Death Star from the "Star Wars" films. Cassini took the photo on May 27, when it was about 634,000 miles (1 million km) from Saturn and nearly aligned with the ring plane. The planet's rings are visible in the image as a narrow, dark band; Dione is above the ring plane, and Mimas is below it. The image was captured using a filter optimized to view in near-infrared light, NASA officials said. The image resolution is 38 miles (61 km) per pixel. The $3.2 billion Cassini-Huygens mission — a joint project involving NASA, the European Space Agency and the Italian Space Agency — launched in 1997 and arrived in the Saturn system in 2004. In January 2005, the mission's Huygens probe touched down on the huge moon Titan, becoming the first spacecraft ever to land on a body beyond the realm of the rocky planets. The Cassini mothership, meanwhile, continues to orbit Saturn, studying the gas giant and its many moons. Cassini will continue this work until September 2017, when it will perform an intentional death dive into Saturn's thick atmosphere. This dramatic end will ensure that Cassini does not contaminate Titan and fellow Saturn satellite Enceladus, both of which may be capable of supporting life, NASA officials have said.